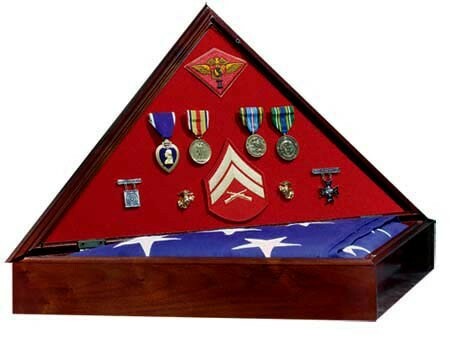 Honor a war veteran; display his American burial flag in a heritage flag case. Each heritage flag display case is handmade in the USA, from walnut wood that’s solid and refined. The heritage flag case comes with a walnut finish, service-specific medallion, a free four-line brass nameplate. The Heritage flag case is chosen by the United States Military for the families of our fallen heroes serving in the Armed Forces. The flag case is manufactured right here in the USA. Each flag display case is assembled by hand utilizing the finest carpentry techniques and then put through a seven step finishing process. 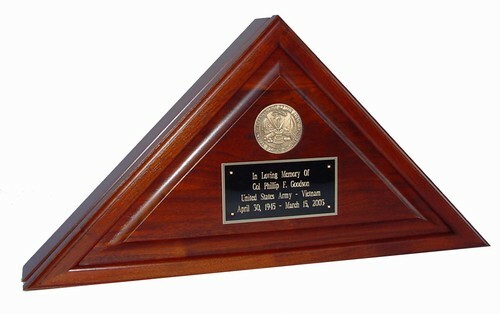 This solid wood flag case comes with an Heirloom Walnut Finish and includes a service specific medallion (Great Seal of the United States, Army, Navy, Air Force, Marines, Coast Guard). Available in 3 background colors we will automatically coordinate the correct color with service branch. Designed to display the American burial flag and and memorabilia. The Heritage is designed to set on a flat surface or hang on a wall.